That is, until early January 2019, when news broke that hackers had broken into the servers of computer game maker BlankMediaGames and made off with account details of some 7.6 million people who had signed up to play “Town of Salem, the company’s browser-based role playing game. That stolen information has since been posted and resold in underground forums. 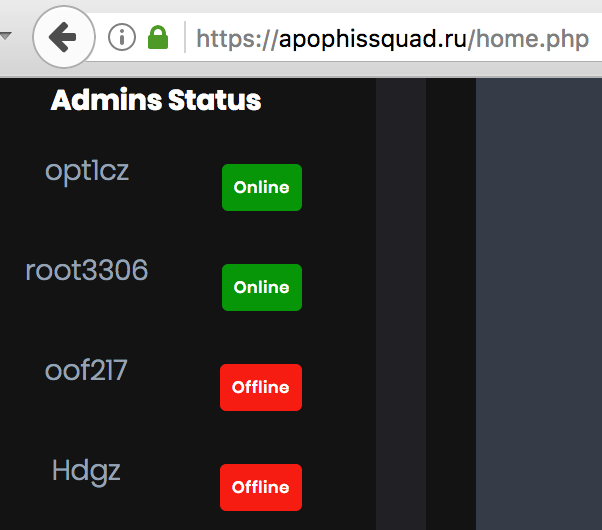 A review of the leaked BlankMediaGames user database shows that in late 2018, someone who selected the username “hdgzero” signed up to play Town of Salem, registering with the email address xavierfarbel@gmail.com. The data also shows this person registered at the site using a Sprint mobile device with an Internet address that traced back to the Carolinas. The Justice Department indictment against Vaughn and Duke-Cohan released this week alleges the pair were equally responsible for sending spoofed bomb threat emails to 2,000 schools in the United States and more than 400 in the U.K., falsely warning that various explosive devices were planted at the schools and would be detonated unless a ransom demand was paid. In this snippet from a January 2018 online chat taken from a channel maintained by HDGZero, the accused can be seen claiming credit for the bomb threats and posting links to stories in various local media outlets about schools evacuating students in response to the threats. The bomb threat emails were made to look like they were sent by different high-profile squads of online gamers competing against one another in the wildly popular game Minecraft. 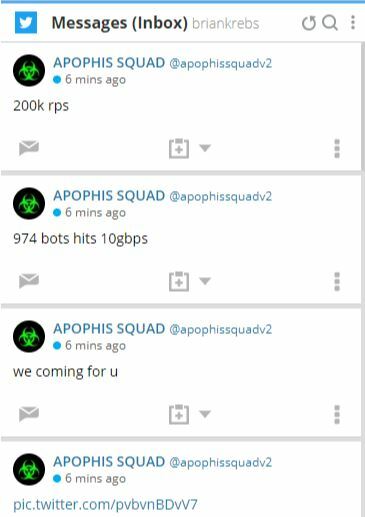 One of the many private Twitter messages I received from the Apophis Squad following DDoS attacks on KrebsOnSecurity. The government maintains that, through their various Twitter handles, Duke-Cohan and Vaughn even offered to take requests for shutting down specific schools with bomb threats. The government alleges that Vaughn also participated with Duke-Cohan in reporting the hijack of a United Airlines flight bound for the United States. That flight, which had almost 300 passengers on board, was later quarantined for four hours in San Francisco pending a full security check. The indictment charges Vaughn and Duke-Cohan with conspiracy and eight additional felony offenses, including making threats to injure in interstate commerce and making interstate threats involving explosives. Vaughn is additionally charged with intentionally damaging a computer and interstate threat to damage a protected computer with intent to extort. A Justice Department press release on the indictment states that if convicted of all 11 charges, Vaughn would face a statutory maximum sentence of 80 years in federal prison. If convicted of the nine charges in the indictment in which he is named, Duke-Cohan would face a statutory maximum sentence of 65 years in federal prison.